Both current and future stars came to the Ratner Athletics Center on Monday. For the second year in a row, the University of Chicago hosted the Powerade Jam Fest, a series of competitions gearing up for the McDonald’s All-American Game. Featuring the top 48 high school boys and girls basketball players in the country, the sold-out Jam Fest did not disappoint. 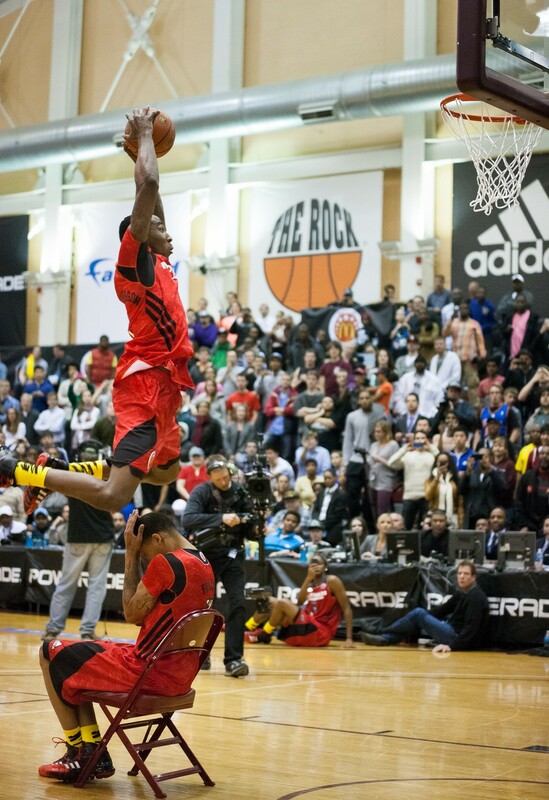 The dunk competition, inaugurated in 1987, is now in its third straight year in Chicago. Freeland took note of the enthusiastic University of Chicago students. It was hard not to be enthused by the caliber of talent at the Ratner Athletics Center. While the names Jabari Parker, Aaron Gordon, Andrew Wiggins, Julius Randle, and Chris Walker may not currently resonate with the general public, these future stars were alongside celebrity judges and broadcasters in the Ratner Athletic Center whose names do. Windy City Live co-host Val Warner, ESPN analyst Stephen A. Smith, baseball and football legend Bo Jackson, Chicago Tribune writer Teddy Greenstein, former Chicago Bear Anthony Adams, and up-and-coming singer and actor Trevor Jackson judged the dunk contest, while former NBA players Jay Williams and Jalen Rose broadcasted the event on ESPNU. After witnessing an hour and a half of fundamentally sound performances in the three-point shootout and skills competition, the fans finally got what they wanted: show-stopping dunks. Chris Walker was the first to light up the stadium. The Florida commit threw up a lob from the sideline in front of a section of University of Chicago students, let the ball bounce once, and threw down an emphatic one-handed slam that even had Stephen A. Smith pulling out the “10” card. The dunk scored a perfect 60 points. Andrew Wiggins, ranked No. 1 on ESPN’s rankings of top recruits for the class of 2013, was the only other competitor to earn a perfect score on a dunk. The undecided senior threw down a 360-degree, through the legs, right-handed jam. All of the judges stood up in awe and naturally gave him top scores. But Walker was crowned the champion. After his four dunks, he had a combined total of 226, beating second-place finisher Aaron Gordon by 13 points. Gordon went on to be the McDonald’s All-American Game MVP. Still, it was not only the All-Americans that displayed their dunking skills. University of Chicago first-year football player Colin Macri competed in a skills competition for fans and dunked the ball so emphatically that the crowd rose to its feet and both Jalen Rose and Jay Williams gave him high-fives. While a decision has not been made as to whether the Jam Fest will take place at the Ratner Athletics Center again next year, the atmosphere made an impact on the celebrities, athletes, and organizers of the event.